A man who beat his partner to death has been found guilty of murder. 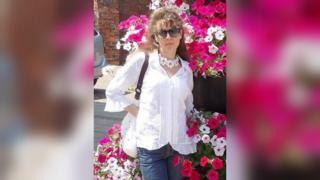 Kestutis Bauzys, 46, had denied killing Dzilva Butiene, 48, in Wisbech, Cambridgeshire, on 5 April. Mrs Butiene had more than 60 bruises and marks on her chest and abdomen and died of internal bleeding, Cambridge Crown Court heard. Police described the murder as "a horrendous case of domestic abuse behind closed doors". Bauzys will be sentenced on Wednesday. The body of Mrs Butiene was discovered in the Wisbech flat she shared with Bauzys in Debenham Court, Orange Grove. She was emaciated and had "clearly been dead for some time", prosecutor Kate Bex QC said. A post-mortem examination revealed she died as a result of "a forceful blow or blows, such as a punch, kick or stamp to her abdomen", she added. Bauzys had tried to claim Mrs Butiene had caused the injuries herself from falling over, detectives said. Det Insp Alan Page, of the Bedfordshire, Cambridgeshire and Hertfordshire Major Crime Unit, said: "The expert medical evidence stated that these type of injuries would be seen either from a forceful assault, a fall from a first floor building or a high speed road collision where the victim wasn't wearing a seatbelt." Bauzys was found hiding in a tent by a roadside a few days after Mrs Butiene's body was found. The jury heard the couple, who had been together for four years, was "lost in alcoholism" and on the day the body was discovered, Bauzys had gone to a local shop to buy vodka and beer - which he did several times a day. "In this case officers had not received any previous reports of domestic abuse," Det Insp Page said. "We would urge anyone who finds themselves in an abusive relationship, please find the courage to tell someone. You don't have to come direct to police but it's not acceptable to live with abuse." Mrs Butiene's family said her death had left "utter devastation" to relatives in Lithuania, including her two sons.